Now that I'm designing, for real, at the new Scraps N' Pieces store...I thought I might need a little help spreading word of my business. So, I'm having my first CT Call. Interested? 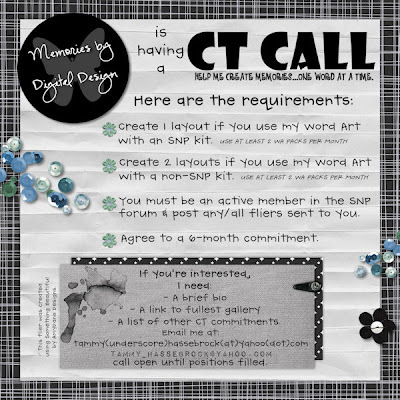 Requirements are simple: 1 LO if you use my Word Art with a kit offered in the SNP store, 2 LOs if you use a non-SNP kit. No enabling required, but very much appreciated. Email me at tammy_hassebrock@yahoo.com if you're interested in joining my team. You'll need to get registered at the Scraps N' Pieces forum. Looking forward to seeing who applies!